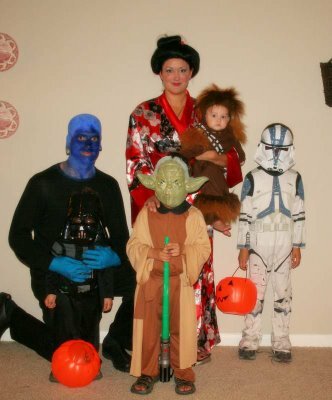 The Bitter Family Blog: Backtracking.... to Halloween! I'm working backwards here. Since I just started the blog, I didn't post the pictures from Halloween. 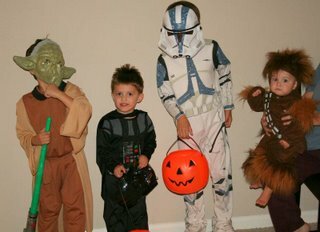 The kids were all Star Wars characters....Logan was a Clone Trooper, Mason was Yoda, Noah was Darth Vader, and the cutest of all was our little Wookie, Roman who was Chewbacca! He was such a furry little doll. All the neighbors oohed and ahhed over him! At least he was warm, that's what I said! A couple of weeks before Halloween Dave and I went to a friend's Halloween party all dressed up. Dave was a member of the Blue Man Group and I was a Geisha. 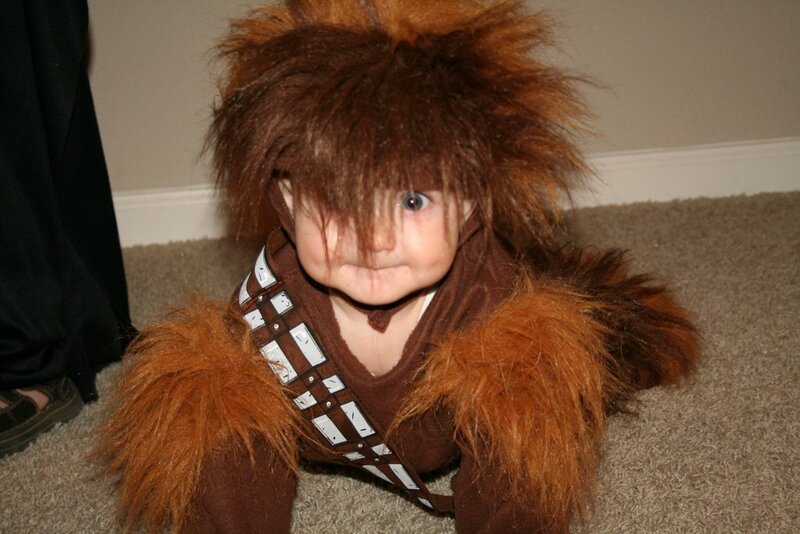 Dave had been working on his costume (his instrament) for months before Halloween. Dave wanted to shave (bic) his head but I had to put my foot down there. So he wore a "skin wig" and painted it with blue makeup. I actually won 1st prize for best girl's costume at the party, but Dave got 2nd. The prize was a $15 gift certificate, which I can always use. Dave dressed up again on Halloween at work and won the costume contest there and won $100 gift certificate to the mall, sweet! He put a lot into it so it made it all worth it! The instrament he made was called a "backpack tubulum" which is what the BlueMan Group really plays. It was quite interesting walking around the neighborhood with him and his large instrament. We got lots of stares and "who ARE you?"s. That's Dave though. He's always original and wants to do everything all the way, not just a half job. The kids loved it! 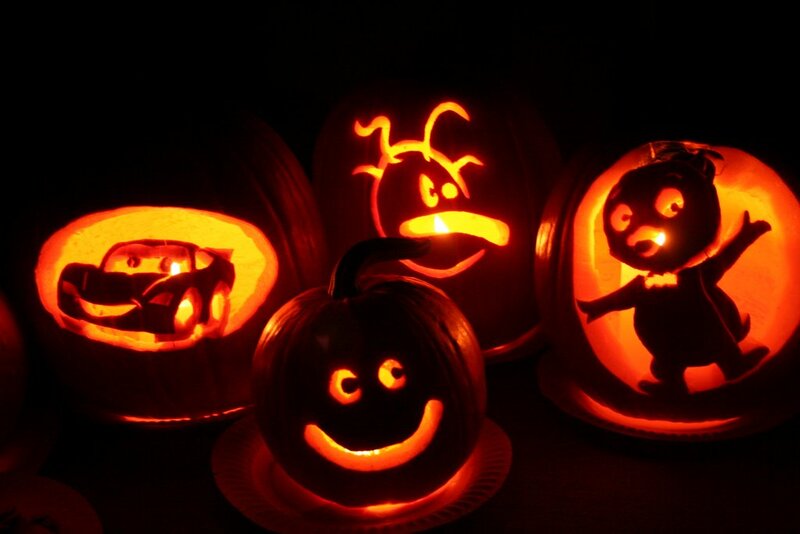 We also have a big pumpkin carving night every year. Dave is quite the carving artist! 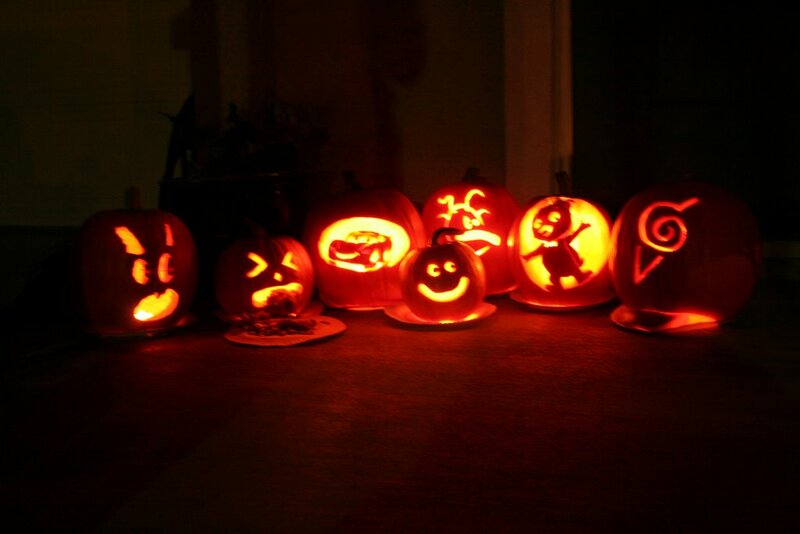 Everyone seems to have pretty elaborate pumpkins these days with all the stencils and books and whatnot. 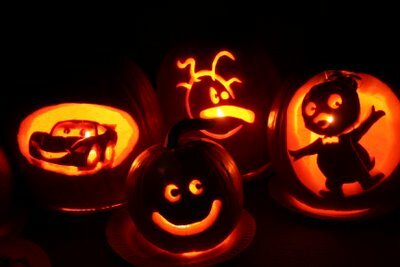 But I have to say, Dave does his freehand, he just gets a picture of a character and turns it into a pumpkin! This year he did Pablo from the Backyardigans (a kids show), Lightning McQueen from the movie Cars, Stink-o man from Homestar Runner, a Loco Roco guy from the video game of the same name, a pumpkin face throwing up, and some symbol from his show Naruto. Logan did an "Evil man" face on his pumpkin. That's a lot of pumpkins, but the kids sure had fun with Dad. I'm not much a pumpkin carver, too gooey and messy for me. 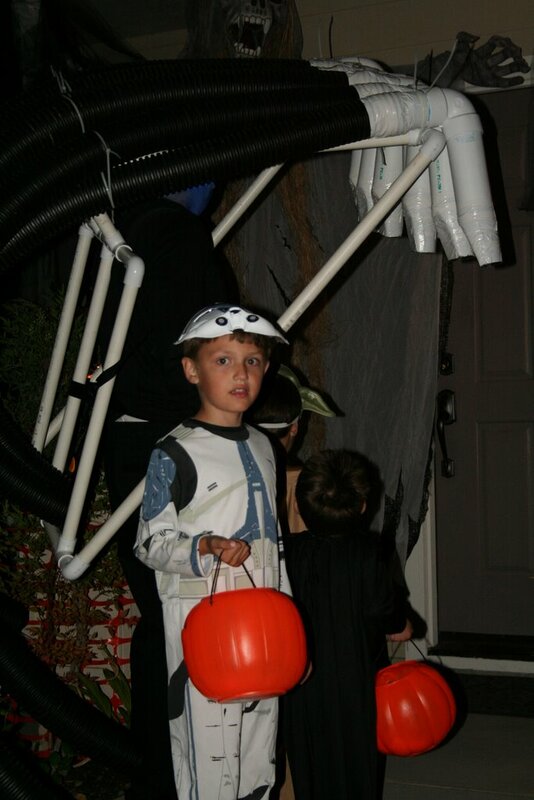 All in all, it was a really fun Halloween! The kids had a blast trick or treating and we had fun dressing up too! Now we're just planning Thanksgiving!